Police are investigating after a car was stolen from outside a house and later crashed into a roundabout in Leighton Buzzard. The Ford Focus ST was stolen from outside a property in Lyra Gardens between 11pm on Friday, May 11, and 1.50am on Saturday, May 12. 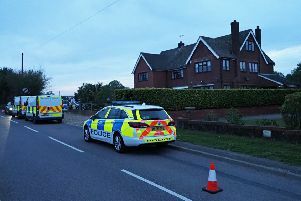 The owner, who does not wish to be named, said: “The police came to my door and told me my car had been involved in a crash. My car was stolen from outside the house and later crashed into the roundabout near Pages Park. “The officer and I checked the house and it had not been broken into, although it looks like they did try to force the front door, the officer believes they may have got the keys through the letterbox as I had left them on the hallway table. “It is annoying because my wife and I always keep our keys out of sight and away from the door but on Friday, after work, I got home and left them on the table and forgot all about them. “It is worrying to think what they might have done had they broke into the house and not found the keys. Bedfordshire Police are appealing for witnesses. A spokesman for the force said: “Shortly after the vehicle was stolen, it was involved in a collision with a roundabout on Johnson Drive.